Light + Love : Bali High. 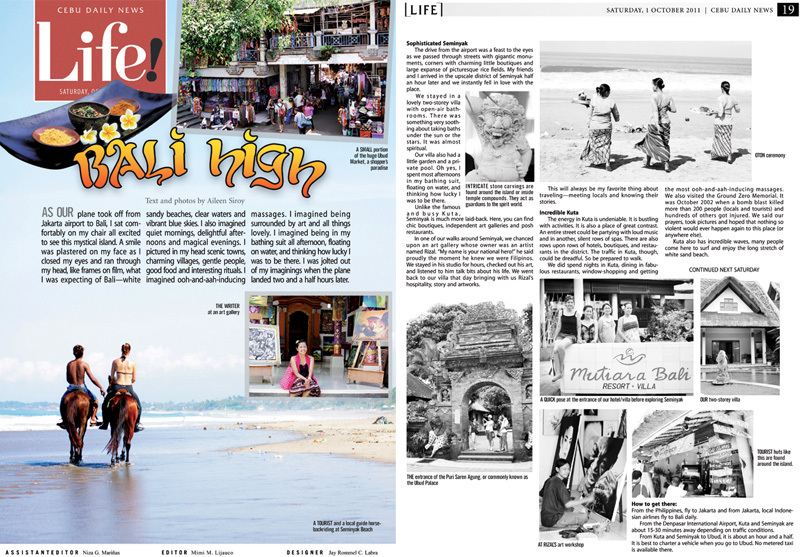 The first part of my Bali article came out last Saturday. My fourth! I still couldn't believe it. Can I now claim I'm a writer? Haha. I haven't gotten my copies yet, but CDN's NM emailed me a PDF copy of the layout (which I converted to JPG). She is so sweet. WEeee, congrats Ate Ai!!! You´re already a write ate Ai long time ago! Natinood na jd ang panagna nga ma regular travel writer naka sa CDN ate. for sure, naay pat 5th,6th article and so on...bonggacious ever ka ate and I super admire you. Keep inspiring us Ate Ai. Amping kanunay and God bless. Wow... amazing talent you got there and unselfishly share it with your fans (i want a copy too ... can we access the article online Ai?). Congratulations and more power to you Ai! Haha! The term 'fans' made me laugh. I'm no celebrity, all I got are very loyal, loving friends! :D I'm not quite sure if the article is available online.